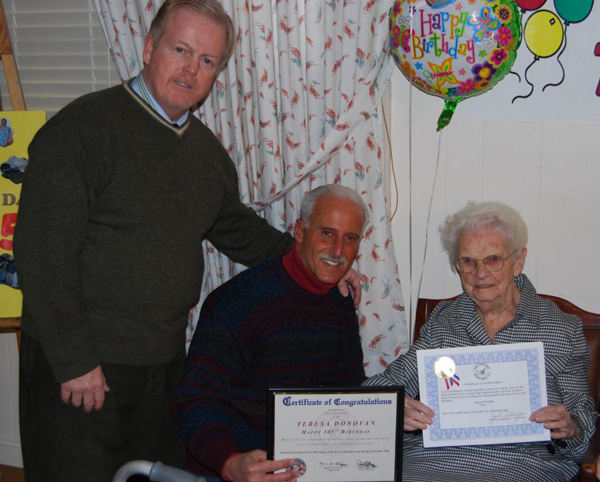 Teresa "Tess" Donovan (right), a resident at McPeak's Assisted Living facility in Patchogue, New York, receives proclamations from Suffolk County Legislator Jack Eddington (left) and Brookhaven Town Councilman Tim Mazzei (center). 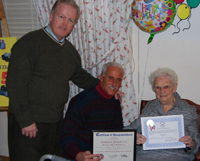 Ms. Donovan celebrated her 105th birthday on December 8 at McPeak's Assisted Living with staff and fellow residents. In celebration of her birthday, they played a game of table bowling, which is Ms. Donovan's favorite pastime at the facility. She prides herself as being a very good and very competitive table bowler. In addition to the people at the facility and other elected officials, Ms. Donovan was joined by members of her family: her son, Robert Brown, and his wife, Gloria; Jeanne Brown, the wife of Ms. Donovan's grandson; and Jessica Brown, Ms. Donovan's great-granddaughter.